Alan Dean Foster (born November 18, 1946) is an American writer of fantasy and science fiction, who has written several book series, more than 20 standalone novels and many faithful novelizations of film scripts. He earned a bachelor's degree in political science and a MFA from the University of California, Los Angeles and currently resides in Prescott, Arizona, with his wife. He is known for his science fiction novels set in the Humanx Commonwealth, an interstellar ethical/political union of species including humankind and the insectoid Thranx. Many of these novels feature Philip Lynx ("Flinx"), an empathic young man who has found himself involved in something which threatens the survival of the Galaxy. Flinx's constant companion since childhood is a minidrag named Pip, a flying, empathic snake capable of spitting a highly corrosive and violently neurotoxic venom. One of Foster's better-known fantasy works is the Spellsinger series, in which a young musician is summoned into a world populated by talking creatures where his music allows him to do real magic whose effects depends on the lyrics of the popular songs he sings (although with somewhat unpredictable results). Many of Foster's works have a strong ecological element to them, often with an environmental twist. Often the villains in his stories experience their downfall because of a lack of respect for other alien species or seemingly innocuous bits of their surroundings. This can be seen in such works as Midworld, about a semi-sentient planet that is essentially one large rainforest, and Cachalot, set on an ocean world populated by sentient cetaceans. Foster usually devotes a large part of his novels to descriptions of the strange environments of alien worlds and the coexistence of their flora and fauna. Perhaps the most extreme example of this is Sentenced to Prism, in which the protagonist finds himself trapped on a world where life is based on silicon rather than carbon, as on Earth. Foster was the ghostwriter of the original novelization of Star Wars which had been credited solely to George Lucas. After two other writers had declined his offer of a flat fee of $5,000 for the work, Lucas brought to Foster the original screenplay, after which Foster fleshed out the backstory of time, place, planets, races, history and technology in such detail that it became canonical for all subsequent Star Wars novels. When asked if it was difficult for him to see Lucas get all the credit for Star Wars, Foster said, "Not at all. It was George's story idea. I was merely expanding upon it. Not having my name on the cover didn't bother me in the least. It would be akin to a contractor demanding to have his name on a Frank Lloyd Wright house." Foster wrote the novel Splinter of the Mind's Eye, a Star Wars sequel published in 1978, two years prior to the release of The Empire Strikes Back. Foster's story relied heavily on abandoned concepts that appeared in Lucas's early treatments for the first film. Foster was stunned when Return of the Jedi revealed the characters of Luke and Leia as brother and sister; in Splinter, the characters exhibit quite a bit of romantic and sexual energy. Although Splinter was contradicted by later entries in the Star Wars film canon, it was the first "Star Wars expanded universe" entry written (although not the first published—a Marvel Comics story holds that honor). Foster wrote the novelization of Star Wars: The Force Awakens. Foster has the story credit for Star Trek: The Motion Picture. He also wrote 10 books based on episodes of the animated Star Trek, the first six books each consisting of three linked novella-length episode adaptations, and the last four being expanded adaptations of single episodes that segued into original story. In the mid-seventies, he wrote original Star Trek stories for the Peter Pan-label Star Trek audio story records. He later wrote the novelization of the 2009 film Star Trek, his first Star Trek novel in over 30 years. He later wrote the novelization for Star Trek's sequel, Star Trek Into Darkness. Foster won the 2008 Grand Master award from the International Association of Media Tie-In Writers. Novels are listed in chronological order of the story (not chronological order of publication). Foster comments, in a foreword to a re-issued edition of Bloodhype, that it is the eleventh novel in the series, and should fall between Running from the Deity and Trouble Magnet. "Serenade" (2004), a novelette set immediately after The Time of the Transference, was first published in the anthology Masters of Fantasy and was later reprinted in Foster's short story collection Exceptions to Reality. ^ Bently, Lionel; Biron, Laura (2014). "The author strikes back: Mutating authorship in the expanded universe". Law and Creativity in the Age of the Entertainment Franchise. Cambridge University Press. p. 44. ISBN 978-1-107-03989-6. ^ Osborn, Alex (18 April 2015). "Star Wars Celebration: Alan Dean Foster Writing The Force Awakens Novelization". ^ Gross, Edward; Altman, Mark A. (28 June 2016). The Fifty-Year Mission: The Complete, Uncensored, Unauthorized Oral History of Star Trek: The First 25 Years. St. Martin's Press. pp. 372–374. ISBN 978-1-4668-7285-1. ^ "Alan Dean Foster Writing Star Trek Movie Adaptation". Archived from the original on 15 February 2009. Retrieved 2009-02-12. ^ "Gallery To Release Star Trek Into Darkness Novel". Retrieved 2013-05-21. ^ Bloodhype foreword, Del Rey, March 2002. ^ "The human blend". WorldCat. Online Computer Library Center. Retrieved 27 April 2010. ^ Ayers, Jeff (2006). Voyages of Imagination: The Star Trek Fiction Companion. Pocket Books. p. 65. ISBN 1-4165-0349-8. ^ Athans, Philip (20 September 2011). "The Fantasy Author's Handbook Interview XVI: Alan Dean Foster". Fantasy Author's Handbook. 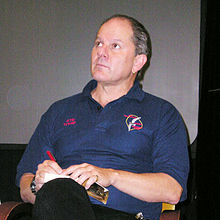 Wikimedia Commons has media related to Alan Dean Foster.